Part of the bestselling Emotionally Healthy Spirituality book collection, this 40-day devotional by Peter Scazzero will help you cultivate your own personal relationship with Jesus rather than living off the spirituality of others. Emotionally Healthy Relationships Day by Day - just like its sister devotional, Emotionally Healthy Spirituality Day by Day - is your invitation into the ancient yet powerful discipline of the Daily Office, the practice of pausing morning and evening to reflect on God's work in your life. Each devotional will reflect on emotionally healthy relational themes, such as clarifying expectations, deep listening, and clean fighting. You'll will be ushered into a transformational practice that will deepen your daily walk with Jesus, and along the way, you'll discover the spiritual nourishment, joy, and peace that comes from meeting with him every day. Emotionally Healthy Relationships Day by Day is also available in Spanish, Relaciones emocionalmente sanas Día a día. 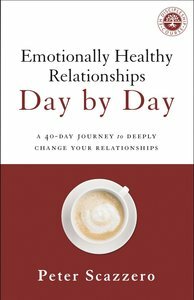 About "Emotionally Healthy Relationships Day By Day: A 40-Day Journey to Deeply Change Your Relationships"